At Great Western we work with many shippers in the handling of their truckload shipments. 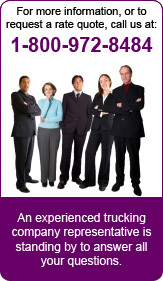 We also offer assistance to many others in helping them to match their large mark Less-than-Truckload (LTL) shipments with other large mark LTL shippers to give all parties the benefit of truckload rate structures. It’s in every shipper’s best interest to consider whether it’s more economical to make smaller, more frequent LTL shipments or to consolidate orders into cheaper, faster truckloads. The correct answer depends on so many factors that no single rule can apply to all shippers. When it comes to cost control, the benefits of combining LTL shipments into full truckloads seems obvious. The cost benefits can be significant enough to range from 5 to 50 percent in savings. If you would have interest in participating in this large mark LTL matching program, please give us a call to discuss the details. Remember, Great Western Transportation specializes in LTL Trucking, Truckload Trucking, Refrigerated Trucking, Temperature-Controlled Trucking, Flatbed Trucking, Power Only Trucking, Heavy Haul Trucking, Over Dimensional Trucking, and Hazmat Trucking throughout the Continental United States and Canada. Don’t Forget We Also Handle Less-than-Truckload Shipments!